Looking for a skin blemish remover? You take your camera with you wherever you go because you know that spontaneous pictures are often more evocative than formal studio shots. You can take care of any spots, pimples, and skin imperfections later – all you need is a photo blemish remover. Movavi Photo Editor can turn your photos into perfect portraits in a heartbeat, and you won’t have to master complicated photo editing software to get there. Read this tutorial and learn how to remove blemishes from photos using Movavi Photo Editor. 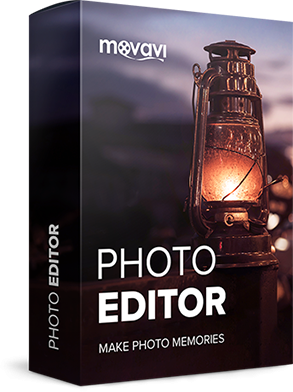 This tutorial applies to both the Windows and Mac versions of Movavi Photo Editor. Just download the version for your OS, install the program, and follow the steps below. Launch the blemish editor on your computer and add the image you want to fix. 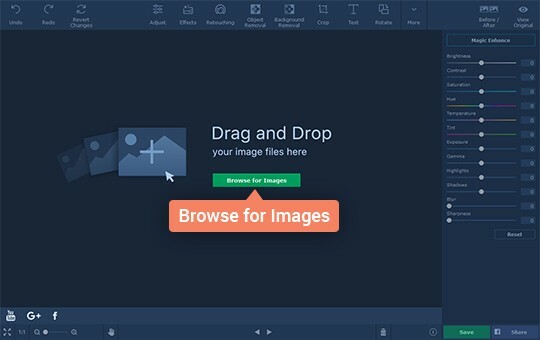 To open a photo for editing, click Browse for Images or simply drag and drop the desired image onto the working area of the Photo Editor. Open the Retouching tab to access the blemish fix options. 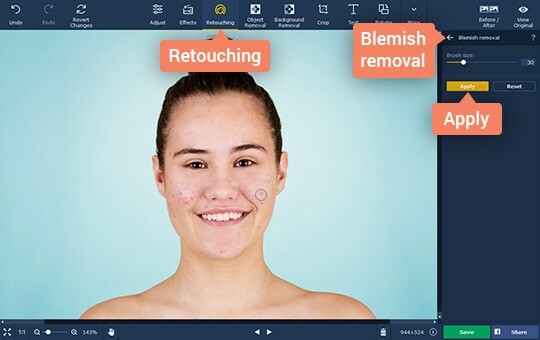 Use the Blemish removal tool to automatically erase pimples, freckles, spots, small wrinkles, and other imperfections – just set the tool size and click on the blemish you want to remove. Then hit Apply to save the result. Note that there’s a dedicated wrinkle remover in our photo editor. 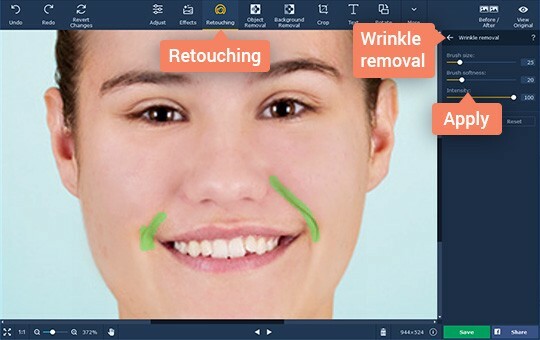 Click the Wrinkle Removal tool to mark and delete prominent wrinkles. Trace the wrinkles by holding the left mouse button. Release the button to make the wrinkles disappear. Adjust the brush size and softness as well as the effect intensity if necessary. When you’re finished, click Apply. 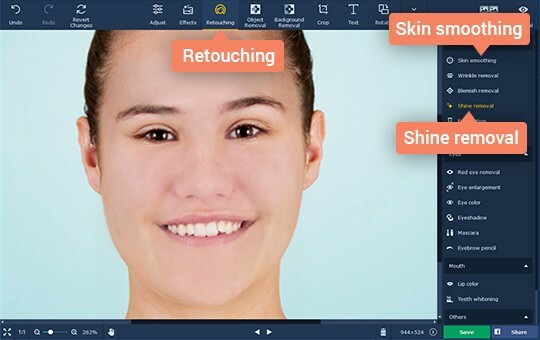 Face blemish removal is more than just getting rid of pimples: achieve the clear skin effect by covering up bumps and pores with the Skin smoothing tool in the Retouching tab. Set the desired brush size and softness, as well as the smoothing intensity, and paint over the problem areas, then click Apply to save the changes. The Shine removal tool will help you reduce reflective glare and oily shine on your skin. 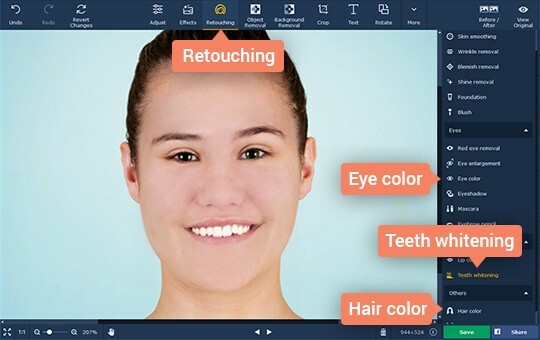 In addition to the blemish corrector, Movavi Photo Editor has other ways to improve portrait looks: eliminate red eye, whiten teeth, apply airbrush makeup, lip tints, and mascara using the dedicated tools. You can even try out new eye and hair shades with the Eye color and Hair color changers. Click on the respective options in the Retouching tab to adjust and apply the changes. After removing all scratches, spots, wrinkles, and other imperfections, you need to save the photo. To do this, click the Save button, then choose the name of your image and the saving format. 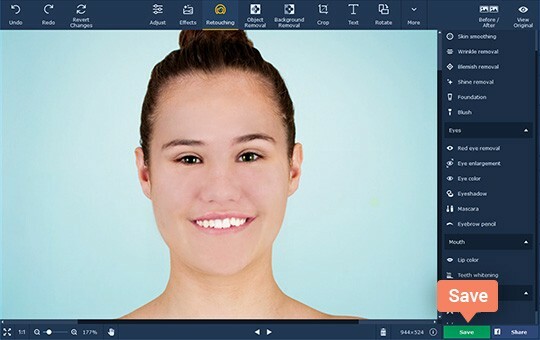 Image retouching has never been so easy – and that’s the beauty of it!